The city of Chicago has exciting plans for people who choose to ride bikes as a mode of transportation, or those who would love to, but are still understandably hesitant. Since there will be some familiar concepts involved as well as new ones, we thought it would be worthwhile to provide you with basic information about the types of bikeways that are available. These are the off-road trails that bicyclists and pedestrians often share. The one that is best-known to Lincoln Parkers is probably the Lake Front Trail, but there are others not too far away, like the North Shore Channel Trail, which runs north along the Chicago river starting near Lawrence and Kimball. These trails are often used for purely recreational purposes, but many people use them as their bicycle commuting route as well. The advantages to these trails are that they are well separated from motorized traffic, and therefore feel very safe to all users. As to what’s in store for Chicago’s off-street trails, there is talk about upgrading the Lake Front Trail, especially in improving the severely congested area around Navy Pier. In addition, the Bloomingdale Trail will be a new three-mile long east-west off-street trail on an old railroad line stretching from Humboldt Park to the Chicago river at 1800 north. These are what most Chicagoans currently picture when they hear “bike lanes”. They are the lanes created by a stripe of paint on the street to the left of the line of parked cars. In some cases, when the street is considered not wide enough for a full lane, there is no stripe, and bicyclists are given a “shared” bike lane, consisting of bike symbols and sharrows (chevron-shaped arrows). These on-street bike lanes are the vast majority of infrastructure we have in place for bicyclists in Chicago, and many were installed in the last 10 years or so. The chief advantage to these seem to be that they’re cheap: The cost is basically the thermoplastic tape (which looks like white paint) used to create the lane, and the cost of the manpower needed to place it. The Armitage bike lane provides an important east-west route for Lincoln Park bicyclists. The down sides to these lanes are that they aren’t really that safe. Putting bicyclists between parked cars and the moving lanes is really a good way of protecting the parked cars, but not so much the humans riding the bikes. The biggest threat is drivers opening their vehicle door just as a bicyclist is passing by, causing a collision and throwing the bicyclist into traffic. It’s often recommended that people ride their bicycle on the outer edge of the bike lane in order to given them more time to react in case someone opens their door, but this forces the bicyclists closer to moving cars on their left, which is not exactly a safe spot, either. Protected bike lanes are on-street bike lanes that have some sort of protection between the bicyclist and the moving traffic. The protection might be a buffer zone created by paint on the street, a row of bollards, a curb or median, or a row of parked cars. These have been standard in European cities like Copenhagen and Amsterdam for decades, but even cities like New York have been installing them in recent years and watching their citizenry take to bicycling in record numbers. 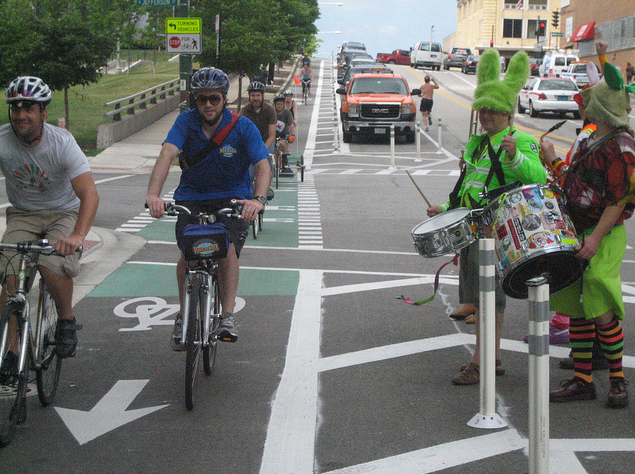 Bicyclists ride the new Kinzie protected bike lane at the ribbon-cutting ceremony in July 2011. We only have a half-mile of protected bike lane currently in Chicago, and that was installed this past June on Kinzie Street from Wells Street to Milwaukee Avenue. Rahm Emanuel has committed to installing 25 miles of protected bike lanes in his first year of office. The next three miles of protected lanes have been announced and are being installed currently. (The closest one to Lincoln Park is on Elston from North Avenue running south to Milwaukee.) That leaves 21.5 miles that will be installed in spring. Apparently CDOT has already chosen the locations but is not yet revealing them, so we’ll have to wait for news on that. Finally, there is the brand new concept of “Bicycle Boulevards”. We don’t have any of these yet in Chicago, but they have become very popular in cities like Portland, Oregon. Bike boulevards are low-traffic side streets that are already pleasant for biking, and that are given certain elements that make them even safer and more enjoyable for bicyclists. These measure might include highly visible signage and street markings, restricting turns onto the street for cars while allowing bicyclists through, adding speed bumps, and adding curb bump outs that force cars to slow down. These are ideal pathways for families to bike to school, or for senior citizens and other cautious riders to reach the grocery store, or the neighborhood library. 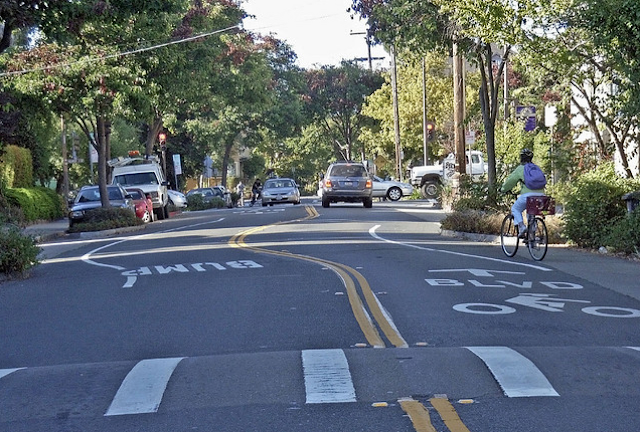 A bicycle boulevard in Berkeley, California, that contains many of the elements that make the street safer for biking. We have a plethora of beautiful and quiet side streets in Lincoln Park that would be excellent candidates for bicycle boulevards. The city would like to plan and install hundreds of miles of these lanes to add to the bikeway network of Chicago. The co-chairs of Bike Walk Lincoln Park have begun receiving initial training on how to provide quality input on this plan for bike boulevards. We will certainly share that knowledge with you in the near future, so we can all work together to provide our input on where the boulevards should go. So those are the basics. Any questions? I'm really grateful for the new bikeways and for the commitment from the mayor's office and CDOT to make it safe for people of all ages and abilities to get around by bike. I think it will eventually be important to distinguish between a well-marked bike lane and a protected bike lane (or cycle track). In my mind, if you're protected from moving vehicles by a row of parked cars, by a curb, or by heavy bollards, it's a cycle track. If the only thing that separates you is paint and plastic posts that are designed to be driven over without scratching the car, it's a well-marked bike lane. In Buenos Aires the motorists have already figured this out, and they just drive over the "reboundable" plastic posts when it's convenient for them to cut corners. If you're a little kid on a bike, the difference between well-marked and protected is pretty big. Parts of the new bikeways are protected and parts are well-marked. I'm not complaining: I think they're using resources wisely and I expect it will bring out a lot more people. I'm just saying it's a transitional stage, and that some day we should expect to see real cycle tracks in every neighborhood that will feel very safe for everyone. Yikes, that's not good news out of Buenos Aires! You're right that the bollards are flexible, even though they look rigid. I guess it's a matter of time before drivers here figure this out, but I'm hoping there's a measure of civility here that will keep Chicagoans from willfully plowing over them. Maybe I'm naive. Stamped brick crosswalks at North and Wells!